For other uses, see C2C (disambiguation). c2c is a British train operating company owned by National Express Group. 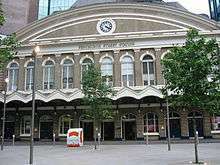 It has operated the London, Tilbury & Southend passenger franchise since May 1996 and became the operator of the replacement Essex Thameside franchise from November 2014. 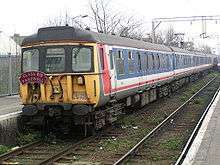 The London, Tilbury & Southend franchise was due to start in February 1996, but after the discovery of ticketing and settlement irregularities within hours of the scheduled handover with the preferred bidder, Enterprise Rail, it was re-tendered. In May 1996, the franchise was awarded to Prism Rail by the Director of Passenger Rail Franchising for 15 years. It began operating as LTS Rail on 26 May 1996. In May 2000, the business was rebranded as c2c. In July 2000, c2c was included in the sale of Prism Rail to National Express. The franchise was originally due to conclude on 26 May 2011. In December 2010, the Department for Transport granted National Express Group an extension until 26 May 2013 to allow it time to conduct a review of the franchising process. In March 2013. the Secretary of State for Transport announced the franchise would again be extended until 13 September 2014. A further delay saw this extended until 8 November 2014. Since February 2012, c2c has been National Express's only UK rail franchise; in 2003 it operated nine. On 9 November 2014, c2c commenced a new 15-year franchise having successfully tendered against Abellio, FirstGroup and MTR Corporation. The new franchise retains the c2c brand, albeit operated through a new legal entity, NXET Trains Limited in lieu of c2c Limited. The c2c name could be conceived to represent city to coast or capital to coast, reflecting the nature of the route, or commitment to customers. The name c2c doesn't mean anything specific. In a sense it can mean anything you want it to. Its uniqueness reflects the young, vibrant character of the people we serve. c2c could stand for coast to capital, or capital to coast. From our point of view, one of the most important things it stands for is commitment to customers. National Express now also refers to the c2c route as City to Coast. c2c used the slogan way2go, but now uses the Making travel simpler slogan also used by other companies in the National Express Group. All stations on the route are managed by c2c except West Ham and Stratford, which is managed by London Underground and London Liverpool Street which is managed by Network Rail. c2c operates services on the London, Tilbury and Southend Railway line from London Fenchurch Street to the northern Thames Gateway area of southern Essex, including Grays, Leigh-on-Sea and Southend-on-Sea. The main route from Fenchurch Street to Shoeburyness is 39.5 miles (63.57 km), with a fastest timetabled journey time of 58 minutes giving an average speed of 40.7 mph, although the route can be done in 47 minutes, an average speed of 50 mph. The line has a speed limit of 75 mph (121 km/h), although the Class 357 Electrostar trains are capable of 100 mph (160 km/h). 2 to Grays via Rainham, stopping at all stations. In the rush hour there are additional services, with a few services to/from London starting/terminating at Laindon, Pitsea and Leigh-on-Sea. In the morning, one peak time service doesn't call at West Ham and Limehouse and one calls at West Ham, missing Limehouse, other than this, all trains call at West Ham and Limehouse. In the evening, all trains stop at Limehouse and very few miss out West Ham. This was changed in the new December 2015 timetable. On Sundays, the non-stopping service to Shoeburyness does not run. Additionally some early morning and late evening weekday services to/from Shoeburyness and Grays terminate at Barking via Rainham. As c2c is mainly a London commuter railway and the typical c2c journey is between 40 and 80 minutes, c2c does not offer first-class seating. Its Class 357s have standard high-density 3+2 seating to meet high demand at peak times, however 17 trains were converted into a "metro" style with 2+2 seating and grab handles. 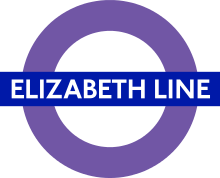 London Underground's District line connects with c2c indirectly at Tower Hill (for Fenchurch Street) and directly at West Ham, Barking and Upminster. Tickets are fully interchangeable between the two operators. There are also interchanges at Limehouse and West Ham with Docklands Light Railway and at Barking and Upminster with London Overground. Some peak services do not call at West Ham due to signalling. A peak timetable introduced on 11 December 2006, with the aim of improving services for the Thurrock and London Riverside sections of the Thames Gateway, was withdrawn on 8 January 2007 after a campaign by passengers as a result of delays and cancellations that affected other lines on the network. In January 2005 it was announced that an on-train television service would be tried out, and one unit had television installed. In June 2006 the 360 On-Board Television service ran into financial difficulties when c2c's partner in the project, TNCI (UK), ceased trading, and the service was withdrawn. c2c indicated it would restart the roll-out should a suitable partner be found. In June 2006 it was announced that portable X-ray machines and metal detectors would be randomly placed at stations and carried by officers on trains during summer 2006 to catch people carrying weapons, in a joint operation with Essex Police and British Transport Police, following trials at London Underground stations. In October 2007 c2c announced that the first coach of each unit would be made a Quiet Zone, where passengers are asked not to use their mobile phones or play music out loud. The Quiet Zone was introduced in early 2008 and is indicated by magenta vinyl stickers on the doors of the coach. As of December 2015 c2c run two trains an hour on weekends that have been diverted into London Liverpool Street instead of Fenchurch Street to/from Shoeburyness primarily to serve Westfield Stratford City as part of the new timetable, these services call at Stratford, Barking, then all stations to Shoeburyness via Basildon, additional early morning and late evening weekend services terminate at Southend Central and Grays. Also when engineering work blocks access to Fenchurch Street all services are then diverted into Liverpool Street. This route runs over part of the London Overground Gospel Oak to Barking line, however trains pass through Woodgrange Park station without stopping. Tickets for trains between Fenchurch Street and Upminster are inter-available with London Underground services between Tower Hill and Upminster, at Transport for London fares. All other journeys are priced by c2c. Oyster card pay-as-you-go has been available since 2004 at stations between Fenchurch Street/Liverpool Street and Upminster. 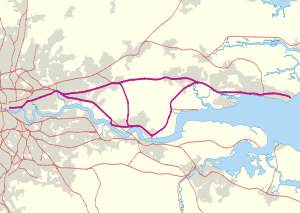 It was extended to Rainham in 2008 and beyond Travelcard Zone 6 to Grays in January 2010. Oyster cards may be purchased or topped up at some c2c stations that are not also London Underground stations, including Chafford Hundred, Grays, and Purfleet. c2c ticket machines in the Oyster PAYG area have been upgraded so they can read Oyster cards. c2c inherited a fleet of Class 302, Class 310 and Class 312s from British Rail. To replace the Class 302s, seventeen Class 317s were hired from West Anglia Great Northern from 1996 until 1999 as Class 357s entered service. A franchise commitment was the replacement of the entire fleet, resulting in c2c ordering a fleet of Class 357 Electrostars. In 2003, c2c became the first train operating company to replace its entire fleet with new trains. In March 2007, after extensive trials, c2c began fitting regenerative braking to its fleet, becoming the first UK train operator to do so. On 3 June 2007, the eve of World Environment Day, 357010 was given an all-over green vinyl sticker livery with the slogan "All c2c trains are greener now – find out more at – www.c2c-online.co.uk – c2c – the greener way to go" to highlight the completion of the scheme, which the company says has enabled energy savings of up to 20%. On 2 October 2007, c2c announced that it had switched to renewably-generated electricity in all its stations, maintenance facilities and offices in a contract with E.ON UK, said to be the largest of its kind in the transport sector. 357010 lost its green livery in March 2011 as part of the relivery project. With a few Class 357s being out of service at the same time, from late 2006 two Class 321s were hired from Silverlink for three months for weekday peak-hour use on between Fenchurch Street and Laindon, and Pitsea via Rainham, to cover for the unavailable units. The Class 321s were used with guards as they were incompatible with the positioning of c2c's Driver Only Operation mirrors. In June 2009, Bombardier began repainting the Class 357 units. The vinyl wraps carrying the original purplish blue and magenta c2c livery were removed and the units reliveried in white with dark blue doors. As part of its new franchise, c2c has committed to leasing new trains to cope with rising passenger numbers, which were boosted especially by the opening of the DLR station at West Ham in 2011 and the rise of Canary Wharf as a financial centre. 9 new four-car trains will be introduced by 2019, followed by 4 more by 2022 and 4 more by 2024. In late 2015 c2c retrofitted 20% of trains into a "metro" style. These trains have 2+2 seats compared to 3+2 seats, to allow more standing space. This was due to the fact that many trains call at intermediate stations so people travelling longer distances couldn't always board the train in favour of people going a short distance to West Ham or Barking. c2c's fleet is maintained at East Ham Depot, although there is also a depot at Shoeburyness. ↑ "Office of Passenger Rail Franchising:The award of the first three passenger rail franchises". National Audit Office. 2 January 2008. Retrieved 19 July 2008. ↑ Routledge, Paul (4 February 1996). "Inquiry into ticket fraud stalls rail sell-off". The Independent. London. ↑ Wolmar, Christian (5 February 1996). "Government orders rail fraud inquiry". The Independent. London. ↑ Grimond, Magnus (30 May 1996). "Soaring Prism renews rail sale attack". The Independent. London. ↑ Osborne, Alistair (19 July 2000). "National Express buys Prism for £166m". The Daily Telegraph. London. ↑ Harper, Keith (19 July 2000). "National Express buys Prism for £166m". The Guardian. London. ↑ "c2c extension awarded to National Express". Railnews. Stevenage. 23 December 2010. ↑ "Annual Report 2002" (PDF). National Express. 13 March 2003. ↑ "C2c awarded 15-year Essex Thameside rail franchise". BBC News. 27 June 2014. Retrieved 27 June 2014. ↑ Track Off. "Railways Today". Archived from the original on 19 June 2008. Retrieved 19 July 2008. ↑ "Unternehmen". National Express Rail GmbH. Retrieved 2016-01-26. ↑ "Train Times" (PDF). c2c. 13 December 2009. Retrieved 12 January 2010. 1 2 "New timetable for c2c begins 11 December". c2c. 9 October 2006. Archived from the original on 15 May 2008. Retrieved 19 July 2008. ↑ "Morning and evening weekday peak schedules to return to previous patterns as c2c restores old timetable". c2c. 3 January 2007. Archived from the original on 15 May 2008. Retrieved 19 July 2008. ↑ Pritchard, Rob (3 January 2007). "Old c2c timetable back on Monday". Southend Echo. Retrieved 19 July 2008. ↑ "TV on Trains – Trials Stopped" (Press release). c2c. 20 June 2006. Retrieved 19 July 2008. ↑ "Railway passengers to be scanned". BBC News. 6 June 2006. Retrieved 19 July 2008. ↑ Consumer Deals (29 October 2007). "The Unofficial c2c Rail Info Site". Retrieved 19 July 2008. ↑ "Quiet Zone". c2c. 2008. Retrieved 19 July 2008. ↑ c2c online: 13 December 2009 timetable. ↑ "Using Oyster PAYG on c2c". c2c. 2 January 2008. Archived from the original on 17 July 2009. Retrieved 30 July 2009. ↑ "January 2010 Fare Changes" (PDF). Greater London Authority. 2009. 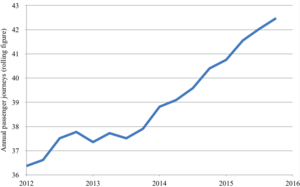 ↑ "ORR passenger numbers by train operating company". ORR. ↑ "c2c takes the lead in energy saving train travel" (Press release). c2c. 3 June 2007. Retrieved 19 July 2008. ↑ "Green Credentials". c2c. 4 June 2007. Retrieved 19 July 2008. ↑ "c2c switches to renewable energy sources". c2c. 2 October 2007. Archived from the original on 5 July 2008. Retrieved 19 July 2008. 1 2 "c2c Commuter News – June 2009" (PDF). c2c. June 2009. Retrieved 14 August 2009. ↑ sinkplunger (24 September 2009). "Flickr: Class 357001 National Express". Retrieved 31 December 2009. ↑ "c2c: The Timetables, They Are A-Changin'". ↑ "c2c awarded 15-year Essex Thameside rail franchise". BBC News. 27 June 2014. ↑ "c2c New trains". Retrieved 11 March 2016. Google. "Stations, route and alternative diversion to Liverpool Street & Stratford" (Map). Google Maps. Google.